In my third post on a sample 1944 Panzer Grenadier Defend List I will cover off some Option B lists. As I have mentioned before an Option B can comprise up to 100 points of troops in 1944. However, before starting to select troops lets review the situations that the Scenario Generation System allows us to use an Option B in. Firstly you can't elect to use an Option B List when defending against an enemy Hasty Attack or Deliberate Attack. In these situations you can only select an Option A. However, if your opponent has opted to conduct a Deliberate Attack you can declare you wish to conduct a Spoiling Attack. In this situation you immediately have reversed the tactical situation and become the attacker. This models the situation that while the nominal attacker is working out his fire plans, moving troops forward to start lines for his main effort, you have been ordered to disrupt him by launching a spoiling attack. Now, the good news is that in a Spoiling Attack you receive an Option B list without suffering any victory point penalty. Therefore every defend list needs to have an Option B list! The rules around Spoiling Attacks can be found in sections 5.1 and 5.1.3 of the Scenario Generation System. In addition in fluid operational situations you may also be required to use a Defend List. Here you are considered to be conducting limited offensive operations and not always with pursuit or breakthrough formations. In wargame terms these are of course encounter battles. In these situations you can use either an Option A or B, but in each you suffer a victory point penalty. The rules are covered under section 5.2 of the Scenario Generation System. Therefore, an Option B in a defend list list is always going to be used in offensive situations and as such we should customise the list for that purpose. You may recall our original Defend List had three motorised Panzer Grenadier battalions, all on foot, one of which was understrength. The list also had two Stug Companies, from the divisional Panzer Battalion, as well as limited artillery and flak support. So let see what we can add to transform the Defend List into one that can conduct limited offensive operations. The Stugs when modified by German regulars come to 50 points while the artillery, also Greman regulars but with only the FAO on-table, come to 48 points. With two points remaining I will purchase some additional entrenchments as they can be used in an "Advance to Contact" scenario, refer section 5.2.1 of the Scenario System. 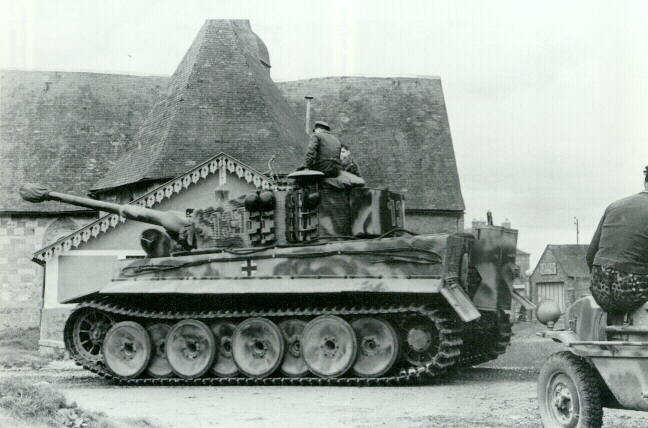 However, a reminder about Stugs. They cannot move and fire, therefore your attack planning needs to consider this carefully. The second option is included as an illustration of how you can add variety while using options. We all know that players are very nervous about Tigers so a Tiger company seems an ideal option to focus your opponent's thinking. Tigers in 1944 should be rated as veterans so you will consume your points allocation quickly. The base points for a weak two stand Tiger company is only 54 points. However, when it is multiplied by the German veteran modifier of 1.4 these two stands become 76 points. This leaves only 24 points which isn't even enough for a weak Werfer battalion! However, buried in the lists are some other indirect fire options. Firstly, you may recall that our third motorised Panzer Grenadier battalion was understrength and did not have its 120mm mortar. We can add this and increase the indirect fire component of the battalion. Further, each Panzer Grenadier Regimental HQ has the option of a single 150mm Infantry Gun. Applying the modifiers these stands come to 24 points which means this Option B sits perfectly at 100 points. If you don't like the additional mortars and infantry gun consider adding some additional flak instead. The final option draws in aspects of several sublists to provide both additional Stugs, some additional artillery support and some additional anti-aircraft. In some ways it is even more balanced than the other options as it bolsters capabilities in all these areas. As before the understrength Nebelwerfers are, excluding the observer, off table. As a result the final costings of all the above come to 98 points. To which we can add two entrenchments for good measure, which we may or may not get to use depending on the scenario. Again, we are at the absolute limit of attachments across our three Panzer Grenadier battalions so care must be made when attaching companies. I would typically see the 3rd Panzer Grenadier Battalion, which you may recall was the weak battalion, with two companies of Stugs and the divisional flakvierling. One of the other battalions would have a Stug company with anti-aircraft cover provided by the Panzer Grenadier Regimental 20mm flak platoon as well as the Panzer Battalion flak platoon, with each platoon counting as a company for attachment purposes. The next question is how do you use the defend list. Well, firstly you have paid a 20% premium for being German, compared to your American and British opponent. This premium is for your command and control. I encourage you to use this by operating a flexible defence. By this I mean be prepared to move your battalions around. You have three battalions and there is a good chance one is not going to be engaged. This battalion is your designated reserve and while it may hold a portion of the line it can move to reinforce other battalions. However, if the enemy axis of advance is different than you expected any other battalion can become your reserve. Be prepared to move this reserve to a decisive point of the battlefield. Within battalion defence positions consider carefully the likely enemy routes of attack. Position the elements of your battalion to cover these positions. I usually try and establish company sized defences but always hold a small battalion reserve. This is not deployed to far forward and can realign reasonably quickly to positions that are likely to become threatened. Pivoting stands takes time, so being held back speeds the introduction of the battalion reserve to the line. Use terrain to conceal and protect your troops. A wood line will greatly reduce casualties as will entrenchments. However, both can be abandoned and should be if the situation warrants it. Further, ensure you are achieving the first fires from stationary positions. Consider carefully your use of supporting troops. If your opponent has invested heavily in counter-battery assets engaing with artillery too soon can expose your limited artillery assets to devastating artillery fires. Sometimes it is more effective to retain your artillery fire so it can be combined with direct small arms fire. Likewise your Stugs can be useful in engaging infantry, as well as the enemy armour. All the Stugs are support stands so can fire through the fighting stands of the battalion they are allocated to support. But don't forget they are not tanks, they must be stationary to fire and can not be hull down. Further, remember the allies rule the air, keep your Stugs well protected from enemy aircraft by the careful positioning of anti-aircraft in defence and when on the move. Finally, if you are likely to be subjected to a deliberate attack consider conducting a spoiling attack. Again, you have paid additional points for being German. A spoiling attack can sometimes catch your opponent by surprise and makes use of the increased command and control capability of your Germans, but before you decide this consider carefully the terrain. That completes my series first series of articles on one possible Panzer Grenadier Defend list. I hope you have found this exercise of interest. You can also download the complete list with all options included. The file, formatted as a pdf, can be found here. Now just to wrap this first series of articles here is a link to get you in the mood. Step back to Normandy and 1944 and gather your forces to halt the Americans and British.